Digital Foundry takes it for a spin. It's the must-have download this Christmas. 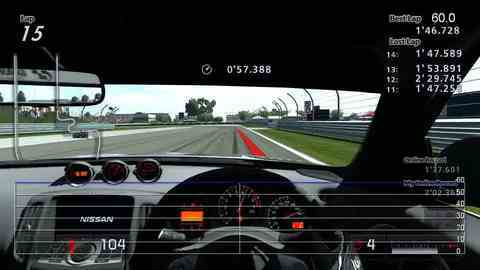 Polyphony Digital is on the brink of launching a brand new Gran Turismo 5 demo, and we've got an early preview. Already its treasures have been plundered with a 1080p screenshot gallery and an HD edit showing off the intro screen, gameplay and replay quality. Now it's time to put the code up to the usual DF image quality and performance tests. First things first, there has been some talk about this sampler not actually being a GT5 demo. This is true in the sense that it is a one-circuit, lap-time-driven time trial: an extremely small, very limited and ultra cut-down version of what promises to be one of the most content-rich games seen on console. However, the wording on the splash screen itself confirms that - in the eyes of Polyphony Digital at least - this is indeed a "GT5 demo", representative of the driving experience of the full game. The demo's splash screen confirms that this is indeed a GT5 demo, though content and options are limited for the purposes of the time trial competition. In terms of actual rendering spec, not much has changed at all from the GT5 Prologue code. Limit your PS3 to 720p mode and you get native resolution with 4x multi-sampling anti-aliasing (MSAA). Invoke the might of 1080p, and the framebuffer is set at 1280x1080. That's a 50 per cent resolution increase over 720p mode, with AA dropped to 2x. The RSX scaler then presumably kicks in with its horizontal bilinear resize to 1920x1080, and the HUD elements are overlaid on top of that. While GT5P ran its menu screens at full 1080p, it appears that the new demo's intro screens stick with the same resolution as gameplay. Rendering tech looks mostly unchanged from the GT5 Prologue. Top shots give examples of the 720p mode in action, while the bottom shots showcase the 1080p display. 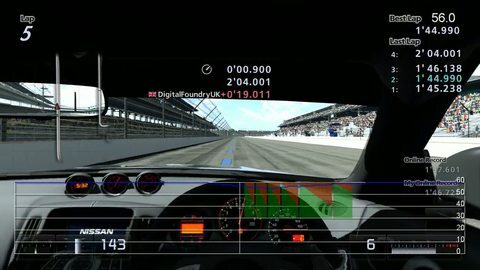 For those not used to the simulation settings of Gran Turismo, this makes the two vehicles included in the demo something of a handful. The road version of the 370Z in particular feels like an absolute lump, while keeping the rear end of the race-spec version under control takes some doing, especially if you've conditioned yourself to Forza Motorsport 3's arcade handling options in recent months. Around five per cent of the total 60Hz output consisted of torn frames, with a minimum frame-rate of 52FPS. It's interesting to note that the combination of rendering the fence and the ghost car simultaneously appears to have the most impact on frame-rate, but it is a touch concerning that such a basic-looking track with just one other car in view should affect performance at all. Switching to 1080p, the same test was re-run. Results were fairly similar: the same low of 52FPS, though the torn frame count elevated to around 12 per cent of the system's output. Overall, this seems to be in keeping with the approximate performance level that we saw in GT5 Prologue in much the same conditions. Whether it will be improved in the final game out next year remains to be seen, though it should be pointed out that the gamescom demo we saw earlier in the year also ran in a very similar fashion to Prologue. It's interesting to note Polyphony's approach to the ghost lap. Rather than render the car as a transparency, an interlaced approach is used in order to lower bandwidth and fill-rate. Maintaining 60FPS is a tough call and while Forza 3 is probably the better example of a game that cuts down its alpha textures to an absolute minimum, GT5 too uses similar tricks in order to maintain frame-rate. Alpha-to-coverage (a cheaper transparency technique) is used in both games, though the use of MSAA does mitigate the screen-door effect. As you would expect from a Polyphony Digital game, overall image quality is outstanding, although it is rather odd that the low-quality shadow filtering should look quite as jaggy as it does considering that (certainly in 720p mode), GT has plenty of MSAA to make things look smoother.